Here at Resmar we are proud to offer our customers the Drager range of professional breathing apparatus and safety equipment for the professional firefighter. The Drager PSS 5000 SCBA represents the state-of-the-art for high-performance breathing apparatus for firefighters. Featuring highly ergonomic and advanced design, with a wide range of configuration options, this has to be one of the most comfortable and versatile first response breathing apparatus units available in the world today. With a wide range of advanced harness choices, being easy to maintain and service, this unit also features an ergonomic, integrated design with versatile hose routing. The Draeger PSS 5000 SCBA uses state-of-the-art Draeger PSS pneumatics along with advanced cylinder strap design. 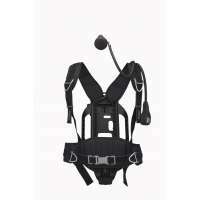 This unit has been purpose- designed to be both comfortable and stable, using a fixed height back plate connected to a rigid harness using advanced materials and a pivoting waist belt. The Draeger standard (DS) harness is a highly cost-effective solution offering ease in donning and doffing along with durability and a high level of comfort for the user. It also features a simple pull forward and down adjustment mechanism making it a highly versatile and easy-to-use system. The Drager Professional (DP) harness has been designed for extended and frequent use; it incorporates hard-wearing stainless steel buckles and Aramid blend long life webbing.